In this picture, the author is looking for ways through which he is trying to get through to the viewer and bring his vision of the world to people. This canvas depicts the artist and his wife Bella. They fly over Vitebsk, over their hometown. Behind them are crooked houses and twilight. 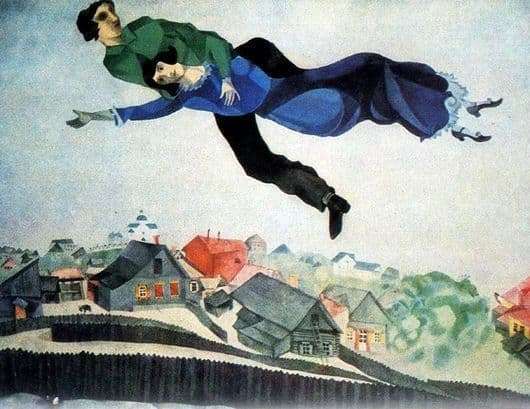 In his work, Chagall always sought to show a man how much time he had, and he wastes it in vain. In addition, the concept of time was based on ideas about human memories and experienced emotions, about what a person wants, what he wants and what he thinks about. On this canvas, the artist did not try to detail the images and objects, he just tried to plunge us into a waking dream. In the world of magical memories and dreams, in which we are where we want to be and do what we want. In the picture there is no connection, however, everyone who sees it will not pass by without appreciating the design and style. No physical framework is unknown to the author, so his paintings are full of allogicality and irrationality. Therefore, the actors of the picture are arranged so that they do not obey logic and physical laws. And the fact that they are surrounded only by routine and memories that will always go together. These souls soaring in the sky are elegant and graceful, trembling in their romantic world. Everything emphasizes their intimacy and feelings. They are lovers and people independent of the ordinary, without blemish and greed, only in their own, ideal idea of ​​the surrounding. The little things are very accurate, it is noticeable in Bella’s appearance, in her shoes and elegant dress, in the eyes of love and the passing city, a sign that everything that does not concern them below and worldly life will wait a bit. In flight, they do not pay attention to anything, they are not disturbed by the coolness of the air and the light darkening of the city, they are in themselves. They are one in their impulse of love.